Blair Athol is located to the south of Pitlochry in the Vale of Atholl, Perthshire. This area is often described as the gateway to the Highlands. The foliage covered distillery buildings have occupied the site since 1798 making Blair Athol one of Scotland’s oldest distilleries. Lemon balm and mint aromas emerge with fresh apples and green melons. The palate has a creamy texture with a balance of oak tannin, spice and fresh fruit. This is a refreshing summery sort of dram. Established in the picturesque town of Pitlochry, the Blair Athol Distillery is one of the oldest working distilleries in Scotland. Blair Athol is another of the handful of distilleries that were founded in the final years of the 18th century. When the activities of the Blair Athol distillery actually began is not known, as it was an illicit operation left undocumented. The introduction of the new licensing laws were followed by a revival of its fortunes in the hands of John Robertson. A long string of different owners followed in rapid succession; Eventually it was acquired, along with Dufftown distillery, by blenders Arthur Bell in 1933 but it stayed out of production until 1949, when it was rebuilt. Arthur Bell became part of Guinness in 1989. which then formed part of the UDV Group (United Distillers and Vintners Diageo). Only 5% of the production is marketed as single malt (among others in the Fauna & Flora collection), the remaining part being sold to blenders. The distillery and the whisky are indeed closely identified with Bells blends. 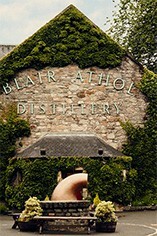 Blair Athol has its own burn, the Allt na Dour which peat-smoked barley very lightly to the distiller's specification. 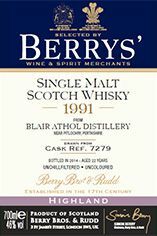 Blair Athol single malt (12 years old house style) is fresh and gently peaty with aroma and flavour which become quite pronounced and lengthy at the finish. It is noted for its tangy, spicy-fruit quality and its very mellow texture. Maybe because it is the largest geographical area, the Highlands is also the hardest Whisky region to pin down stylistically. For this reason it is easiest not to consider the Highlands as one large are, but as 4 smaller and much more distinct ones. North-Highland malts tend to be light bodied, delicate whiskies with complex aromas and a dryish finish sometimes spicy, sometimes	with a trace of salt. Northern Highland distilleries are almost all coastal. The most northerly is Old Pulteney, situated about as far north as you can go in Wick, which produces a delicious, fragrant, dry whisky. Working south along the route of the A9, next comes Clynelish at Brora (built in 1969, beside an earlier distillery who’s whiskies are known as Brora) - a sophisticated and complex whisky older expressions are very highly regarded and the malt deserves to be better known. Perhaps the reason that it is rarely seen as a distillery bottling is that it’s malt is a key component of Johnnie Walker. The best known of all the Northern Highland malts is Glenmorangie. Glenmorangie, is made at Tain on the Cromarty Firth, and is the most popular malt in Scotland. Over the last decade Glenmorangie pioneered the now often copied process of wood finishing. Althoght this process is not universally popular; it transformed the company’s commercial success. The Eastern Highlands produce a number of whiskies that can be confused with those of Speyside. In the north of the region close to the southern border of Speyside, whiskies which are smooth, sometimes with a little smoke, malty-sweet, such as Macduff, Ardmore, Glen Garioch and Knockdhu are made. Further south is Fettercairn,	and Glencadam, at Brechin, which produces an unusual creamy, fruity malt. The area between the Moray and the Tay has two distilleries of note;	Royal Lochnagar and Glendronach. The first is a wonderfully smooth, rich whisky made in the shadow of the mountain of the same name in a distillery established in 1825 The second is also luscious and often sherried. In the Western Highlands there only two distilleries on the mainland those of Oban and Ben Nevis. Oban is a perfect, sheltered harbour makes it the principal	seaport for the Isles and the capital of the West Highlands. Its whisky has a misty, briny character, with a background of heather and peat. The Oban whisky stills used are among the smallest in Scotland; the cramped nature of the site is attested to by the odd position of the worm tubs, fed by unusually short lyne arms, and nestled in the ‘vee’ between the roofs of the still house and an adjoining building. The whiskies of the Central Highlands are a mixed bag. Generally they are lighter-bodied and sweeter that their cousins to the east, but not as sweet as Speysides. The Central Highland single malts used to be known as 'Perthshire Whiskies'. Most are found along the valleys of the Tay and its tributaries. The furthest north is Dalwhinnie, which is almost in Speyside indeed; it is at the very head of the river, over sixty miles from Grantown-on-Spey. Blair Athol and Edradour whisky distilleries are both near Pitlochrie. The former was founded in the	1790s and was substantially rebuilt in 1949 Edradour is the smallest distillery in Scotland - a happy survivor of the days of 'farm distilleries' - yet produces a clean, fresh, attractive and justly popular whisky. South again is Aberfeldy distillery, on the edge of the pretty town of the same name. Glenturret, at Crieff is one of the claimants to being the oldest distillery, although it was dismantled in the 1920s and is much changed.